The topic of food safety in the packaging industry is constantly evolving, with tougher industry standards and increased government regulations becoming the norm. FIBCA recognizes that there are many adequate food safety processes, accreditations, certifications, and schemes for the production of FIBCs; and therefore recommends that all manufacturers, distributors, and users of FIBCs confirm that their process is adequate for each FIBC application. While FIBCA does not endorse one food safety scheme over another, it does strongly support the effort of the Global Food Safety Initiative to establish a global standard. 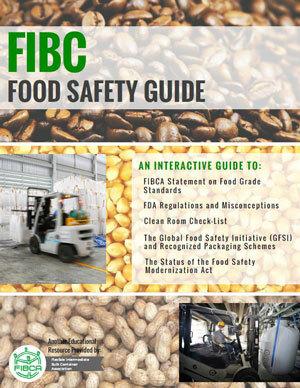 FIBCA has provided this guide to help clarify some common FIBC related food safety questions. The document is an interactive guide with live links to additional information on FDA Regulations & Misconceptions, Clean Room Requirements, the Global Food Safety Initiative and the Food Safety Modernization Act.